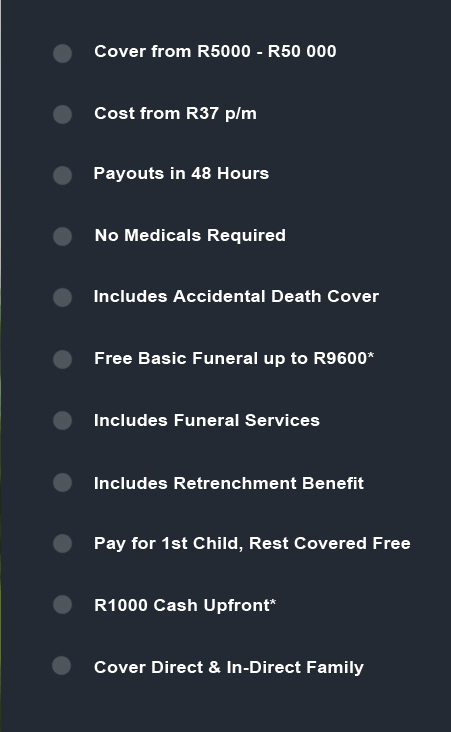 AVBOB Funeral Plan - Compare Funeral Plans in South Africa. On this page, we will look at some of the some of the benefits of an AVBOB Funeral Plan. This is a great funeral plan with a lot of benefits. Firstly, let’s discuss the provider. AVBOB has been around for many, many years. In fact, they have been around for almost 100 years. This should give you the peace of mind that they understand the business. Any company that can be successful this long must be doing something right. They have more than 200 branches in South Africa. It does not matter where you are in the Country; chances are there is a branch near you. AVBOB is a mutual society. A mutual society means the policy holders are shareholders in the company. AVBOB often pay bonuses to their policy holders. The bonus amounts paid to date runs into the Billions. Now, let’s discuss the actual policy. The funeral policy comes with the standard benefit you’d expect. You can cover your direct and in-direct family on the same policy. You can get cover from as little as R5000 to as much as R50 000. There are no medical examinations needed to join. They give you the benefit of the doubt. Because they do not ask any medical questions there will be a 6 month waiting period for natural causes. The 6 month waiting period does not apply to accidental death. In fact, if you claim for accidental death, the cover amount will double. If you have R50 000 cover, this amount will double to R100 000. When you compare funeral plans, you need to compare apples with apples. It’s important to understand what you need to look for. The AVBOB funeral plan is a cash & benefits product. What this means is you get a cash payout, and funeral benefits. Let’s look at an example. If you cover your life for R10 000 and claim, the following will happen. The beneficiary will have the option to take the R10 000 and arrange the burial independently. Alternatively, the beneficiary can make use of the provider to make the arrangements. AVBOB can handle almost all the services required in-house. They deduct the cost of the services from the R10 000. The provider will pay all money that remains to the beneficiary. There is a huge advantage if you use them to arrange the burial. All policy holders who use them get a free basic funeral up to R9600. This means the amount of cover you receive is a lot more than just the R10 000. There are free and optional services. The beneficiary can select what services they want to use. Min R5 000 – Max R50 000 p/m. Up to R9600 Discount on a Basic Funeral. Deceased Transport anywhere in SA. Waiting Period only for Natural Causes. Catering at Home or Church. Chairs at the Grave site or Church. Fresh Flowers at the Church. Funeral Notice in Local Newspaper. Tombstone Erected on Day of Funeral. If you are looking for a product that will take care of everything, this is it. Most of our client who compare funeral plans request a quote from AVBOB. Most people go through a tough time when they claim. It’s good to know that you do not have to worry about all the services required. You can spend valuable time with family and friends. You can rest assured that you will be in great hands with an AVBOB funeral plan. To get a free quote, all you need to do is complete a basic contact form. One of our friendly consultant will phone you to discuss your options. We pride ourselves in great service. We are a registered financial services provider. What this means is you speak to one consultant from the beginning to the end. We do not give your contact details to pushy sales people. Our agents are there to help you make a great decision without forcing you to sign up.